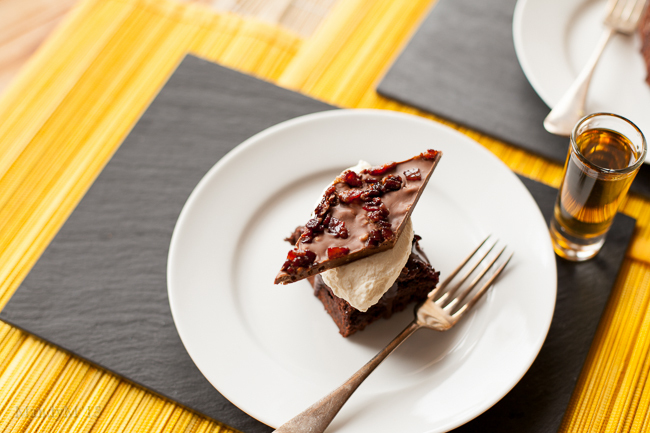 Bourbon Bacon Brownies — What the Fruitcake?! I can't believe we're already halfway through the Great Irish Bake Off season. We've seen flops and failures, amazing bakes and perfect confections. Tears, plenty of laughter, and even a few awkward moments where Biddy seems to be enjoying her tastings a little too much. We also know that Paul likes things to be moist and that Anna loves a good tart. And very sadly, we've said goodbye to some fantastic contestants. You should know the drill by now. First comes my recipe musings, then my ravings (or rantings) about the episode, followed by my actual recipe, all with a good smattering of my clever wit and anecdotes. Or something. I have to be honest, I've had this recipe sitting on my harddrive since before I even decided to do this GIBO blog series, but seeing as it sort of fits in with this week's theme, now is as good a time as any to post it. I give you Bourbon Bacon Brownies. I've fancied them up a little bit and transformed them into more than just a tray baked treat, instead they're now all dressed up and dessert ready. It's amazing what a bit of whipped cream, chocolate sauce and strategically placed chocolate garnish can do! Last year, one of the guys at work sent me a link to these bacon bourbon brownies, he loves bacon and he loves bourbon, so it may have been a subtle hint, or it may have been that he just thought I'd be curious about the strange combination of ingredients. He actually doesn't have much of a sweet tooth, so my baked goods are normally wasted on him, but I could see the appeal. Brownies are rich, but not too sweet. I promised I would give them a try, and then completely forgot about the recipe. Then a couple of months ago I was watching Nadia G making her bacon chocolate and something pinged. Bacon. Chocolate. Brownies! Must try the brownies! So I went through my mail, found the link he'd sent, and made it my weekend's baking mission. It was also a good excuse to pair the brownies up with Nadia's ridiculously delicious bacon chocolate which means I could play with my tempering machine. Not that there's much playing, it's just novelty not having to do all the tempering myself. Bourbon isn't my drink of choice so I sent my workmate an e-mail asking for a bourbon recommendation, he's the go-to-guy for that sorta stuff, and he gave me a few options. Then he also said that the Jack Daniel's Honey Whiskey might work well in a dessert recipe. The man is a genius, I tell you! But I'll get to that soon. I thought I'd try both a bourbon and the honey whiskey, all in the name of baking research, of course. Now, the original recipe was conceived by a guy, so I thought I'd not only try two liquors, but also two different ways of preparing the recipe. I'd use the bourbon for a more... rustic approach (ie. as the recipe stated.) and the honey whiskey with my own approach. I also went for a honey and whiskey barrel smoked bacon and a maple cured bacon, again, the smokey and the sweet. I'm just going to say this right now. It's not that I don't think men can't bake, clearly they can (GIBO anyone? ), but I find that men who are just baking dabblers tend to be a little more rough and rugged in their approach, from they way they mix things up to the way they present their dish. So it was Bourbon vs Whiskey. Smokey vs Sweet. Men vs Female. KIDDING! Jim Beam was my bourbon of choice and I followed the recipe exactly. I found that the bourbon flavour wasn't very strong in the actual brownie, if even noticeable. If I hadn't added bourbon to the whipped cream and chocolate glaze I might not have known there was any in the dessert. Also, the bacon on top ended up rather charred. It was still kinda bacon-ey, but now it was very smoked bacon. It would need to be covered with foil halfway through baking to help protect the meat. Because of this, it didn't actually impart any bacon goodness to the brownie itself. Bits of dried out bacon also didn't look very appetizing, it's already a strange enough idea, you want it to at least look tasty. I was a little bummed. 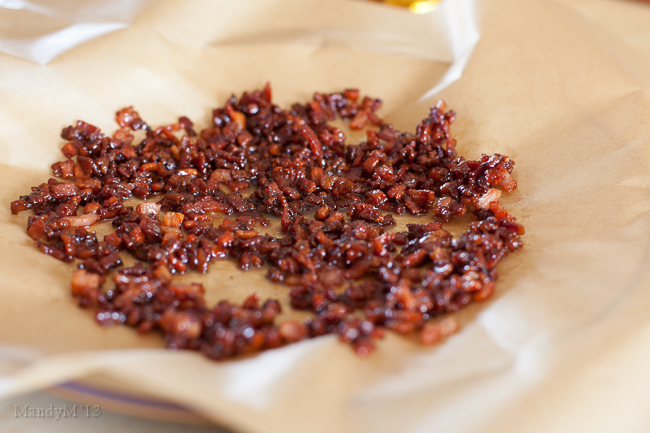 I thought that I could help protect the bacon if I candied it first, and it was exactly what it needed. 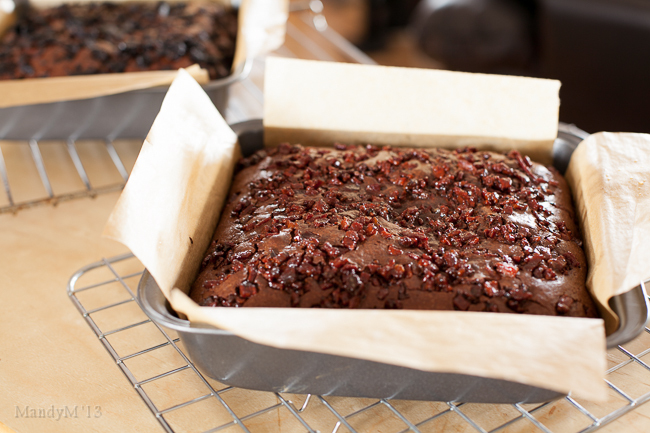 After baking, the bacon still looked like bacon and kept its sweet flavour. 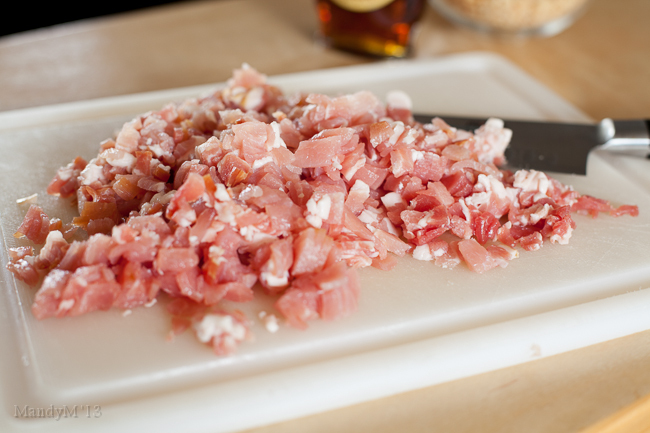 I also much preferred the maple cured to the whiskey barrel wood smoked rashers. I think the sweetness just melded better. 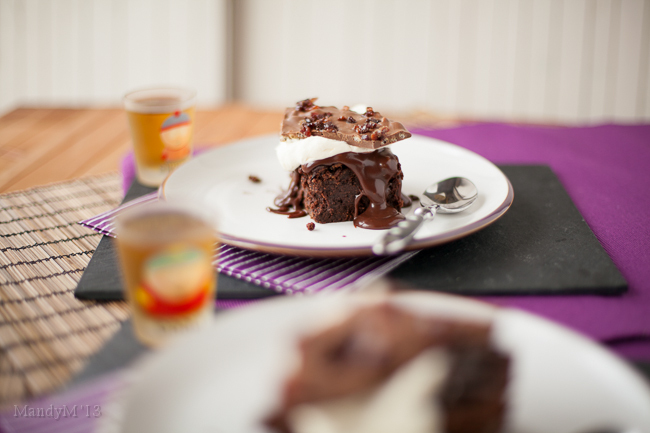 Again, the whiskey didn't really come through in the brownie, so it could have done with a few more splashes, but, I was happy to actually have the flavour of the whiskey come through in the whipped cream and chocolate sauce. The brownies were as brownies should be, rich chocolate and fudgey (I'm a gooey or fudgy girl) and you'd get hits of bacon goodness each time you bit into a chunk of candied yumminess. And let me just tell you. Jack Daniel's Honey Whiskey. YUM! I really liked my version of the dessert as a whole, but because I think this brownie dessert is quite manly, I don't know why, maybe because of the origin of the recipe, I left it up to Andrew to decide which one he preferred. Macho Jim Beam or Mucho Jack Daniel's Honey Whiskey. JD won. Hands down. Or bottoms up? And now! Episode 4 of the Great Irish Bake Off! Tom was asked to hang his apron up in episode three leaving us with nine contestants, and those remaining walked straight into a Technical Bake this week. Biddy contributed the recipe to challenge the bakers, so this week's Technical Bake was Biddy's own Cider & Apple Warm Pudding with Elderflower Custard. Biddy's fond of this recipe as its roots are quite traditionally Irish. While it's not a particularly beautiful looking dessert, Biddy warned that the design on top needed to be thought out ahead. She decided to pair it with an elderflower custard as she feels that home-made custard is becoming a lost craft. (I would say so, as the custard they poured onto the example pudding looked more crème anglaise rather than thick custard.) But, she is right, it's a temperamental and slightly moody sauce, so it would add pressure to the challenge. Especially as the only guidance given on their recipe sheet was "Make the custard." As it turns out, the custard may have been more of a challenge than the actual pudding, especially for those who had never actually made a custard before. To baine marie, or not to bain marie? Wooden spoon? Whisk? We had custard lumps and foam (no whisking, Will!) but mostly we had a runny custard that barely thickened up. I'm with you Maryanne, I prefer a thicker custard. I say add that cornflour, or at least, another egg yolk! 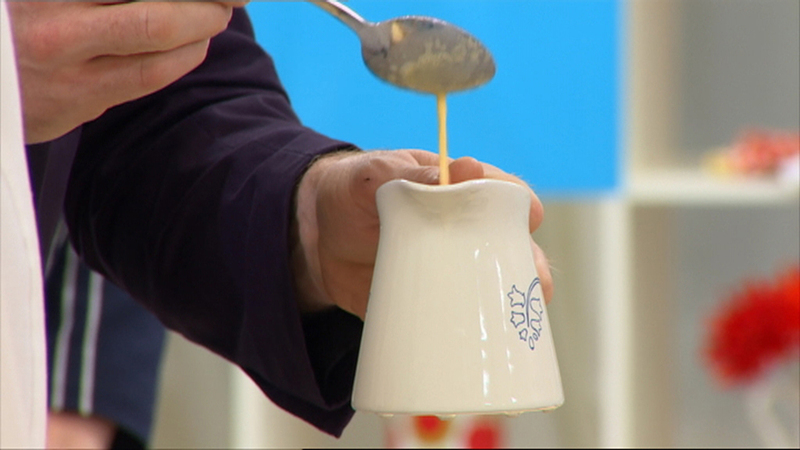 The next challenge, still custard related (maybe this episode should have been dubbed the Great Irish Custard Challenge), was that there were no measurements given for the elderflower syrup. Aoife wasn't sure if the judges wanted a mild aftertaste or if the elderflower needed to be a prominent flavour. I loved Jarek's comment after having a sniff of his syrup, "Oh, it is a disgusting thing. I don't like it." Will guessed that a teaspoon would be enough. Anna ran around distributing more ingredients as it was Curdle Central in the tent, Bridget aptly naming her custard an "eggy cappuccino". I think I would have had the same problem, I would have waited too long for it to thicken up quite a bit, not knowing it wasn't meant to, then ended up with elderflower scrambled eggs. I know, I know, I'm going on about this thin custard. But really, runny custard? Why? Just, why? Even ignoring the episode teases where Maryanne was shown as quite obviously upset about something, when she started talking about her nerves as she might be the focus because of her previous Technical Bake win, and then Paul went on to say that they'd be expecting nothing less from her, already we knew that we were being set up for a baking agony from Maryanne. Maryanne was equally horrified to hear that her custard was bland. But, at least her pudding was beautifully baked. Oonagh, Steve, Jarek, Barbara and Stephen all had good puddings. Well baked, moist, a lovely crumb and with great flavour. Most of the custards disappointed the judges. Either not cooked enough, or overcooked and split. Stephen's custard rated the highest, the judges liked the strength of the elderflower in his sauce. Bridget's pudding put her in ninth place and Jarek was in eighth. Although the judges had initially said that WIll's pudding could have done with more spices and flavour, on reflection, they enjoyed his pudding and he came in second place. They loved the look of Stephen's cake and it had a good texture. He also made a particularly good custard, so he walked away the winner of the Technical Bake. Watch out, Stephen's on a roll here! And this week it was back to having a Show Stopper! The bakers were asked to make a trio of desserts. One had to be a crumble, the second would be a roulade, and the third had to be bread-based. That's a lot of baking for five hours! To be honest, all the desserts sounded great this week, but I was particularly looking forward to seeing Oonagh's Banana & Bourbon Bread Pudding with Butterscotch Sauce, Steve's Guinness & Chocolate Bread Pudding, Bridget's Butterscotch Brioche, Jarek's yeast-based Mama Strudel and Will's Sticky Cinnamon Tear & Share Bread. Everyone was feeling the pressure this week, but the cracks really started to show in Maryanne's usually consistent and confident baking. She forgot to grease the tin for her baked cheesecake and when she finally managed to free it from the pan, the pastry sides cracked and the whole thing was ready to fall apart. The fact that she was brave enough to do a baked cheesecake in the five hours was heroic enough, normally a cheesecake is baked for an hour, in for another hour with the oven turned off, and then left in the fridge overnight. That wasn't all, even though a roulade does normally crack a bit, hers was cracking a little too much. This was when the emotions started to seep out and we saw her crumbling and very near tears. Hers weren't the only desserts cracking up, Bridget's brioche started falling apart with only thirty seconds to go until time up, and there was nothing she could do to fix it. The downfall of not having enough time to leave things to cool properly. Barbara had a great round, her Red Velvet Roulade with a hint of rose really impressed the judges, and it was rather striking. Even though slightly more Swiss roll that roulade, I think it would make a gorgeous Christmas dessert! Jarek's unusual yeasted strudel was also a hit with the judges. They loved the texture and thought the not-too-sweet apple was a perfect filling. Well, it is strudel, after all! Even though Bridget's brioche was presented broken, they loved it. Biddy enjoyed the contrast of the crunchy sprinkling of butterscotch with the soft dough of the bread. Her butterscotch and chocolate stout glaze sounded, and looked, amazing. But then after complimenting the presentation of her crumble, Paul almost ended up with ginger-induced-tears as the spice stung his tongue. Oops! They didn't show Oonagh's bread pudding which I'd been anticipating, but she wowed them with her matcha tea roulade. It looked quite spectacular. The earthy green sponge spirals mixing with the bright white lime-curd flavoured mascarpone filling. I absolutely loved the zig-zagging of Will's tear 'n share bread, as he said, it looked like an accordian. Paul loved the addition of the lemon, and as a whole, really enjoyed the loaf. I love bread, I love cinnamon, I love sticky buns (hehe...) and I'd say I would like Will's dessert too. The presentation of Steve's Guinness and Chocolate Bread Pudding was somewhat lacking. It actually had the appearance of a savoury dish, like a meatloaf with gravy around the edges. And sadly, the flavours didn't help it. Unfortunately we weren't shown the extent of the critique other than Paul calling it bland and not being impressed with the presentation. After doing brilliantly with the Technical Bake, Stephen hurt his ratings with an overly sweet Banana Butterscotch Crumble. And for sugar-loving Paul to say something is too sweet, well, it's just too sweet. It also wasn't Show Stopper pretty. C'mon Stephen! Now's not the time to start slipping! It was quite hard watching Maryanne's dishes being judged. For someone who up until this point has been a solid performer, both with bakes and with stress management, she was having a terrible day in the tent. Her roulade's meringue was underbaked and eggy and her bread pudding was just too dry. And of course, a baked cheesecake barely holding itself together. Last week Anna had mentioned a possible double elimination. It was hinted at again near the start of this episode, and was then confirmed when the judges sat down to deliberate. The first to leave the tent was the hilarious mad hatter Bridget. I guess she burnt her ginger bridges with the judges and I'm really bummed to see her going. Even though the look on Maryanne's face showed that she was convinced that she would be the second to go, it was the peaceful poet Steve Tydell. Steve, I'm sure your brood of kids will be happy to have you back and baking for them, but you will also be missed! And finally, this episode's Star Baker was chosen because their skill impressed the judges and because of their level of improvement. Even though he was convinced it would not be his week, Will took the title. Well done Will! You did brilliantly! Very well deserved. 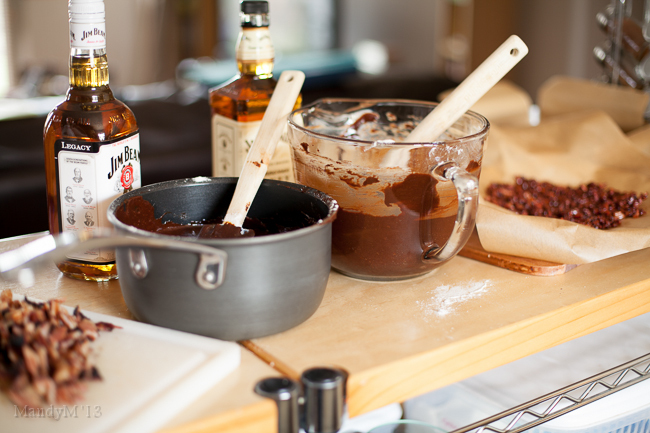 And now, here it is, a Boozey Bourbon (whiskey) Bacon Brownie Beast of a dessert recipe! Posted on October 11, 2013 by Mandy Mortimer and tagged GIBO Great Irish Bake Off Bacon Brownie Bourbon Whiskey Jack Daniel's Honey Whiskey Whipped Cream Chocolate Whiskey Sauce Baked.